oh happy day! i dropped 3 clan members and a boyfriend off at the amusement park and with a hop and skip drove over to my friend Hesta's abode. i love Hesta for many reasons, she is super quirky and her home is filled with handcrafted, thrifted goodness. i could stay all day just looking at her collections and piles of goodness. however today i could not, for today i had just a few hours spare and Hesta was taking me on 'a jolly'! she invited me on 'a jolly' which she told me no other friend would quite get. the 'jolly' first took us to her allotment. upon arriving at Hesta's lovely bit of allotment she got busy getting out her scissors, ribbon and nails. i stood by, taking in this most wonderful moment in my life. i did not think it would ever get better than this. 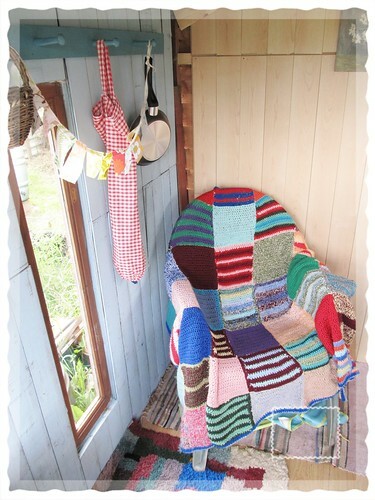 to be asked by a crafty friend to cut the ribbon of her shed is truly beyond anything i have ever been asked before. Hesta explained as the ribbon was cut and the doors opened to reveal the peachy inners, the dreams and hopes she had for her little shed. the extension and the porch she was planning to add on, alongside other little bits and bobs. as i hung up my little itty bitty 'high hope' flags to mark this momentous occasion in my life, i marveled at my friend's passion, her hard work and the dreams i have no doubt she will fulfill one day. after which we got back in Hesta's car and bumbled along the windy roads of Devon, whilst putting the worlds to right. soon i found myself transported to recycling heaven. so many forsaken souls hoping for a last chance. having only a suitcase on my travels i was having to keep my blinkers on. i found a nice roll of retro wallpaper and a little cross stitched rose picture complete with spiffy old frame. 1 pound, 25 p later they were mine to keep. Oh Tif, that postcard looks so cosey and nice, seems to me you had such a day! Hesta has a nice, cozy hideaway. but...I want to see the paper and the cross stitch, too. I love the pictures you paint through the stories on your blog. Your writing style is so unique and charming! I found you through your Etsy Handmade Portrait, which was so true and inspiring. Just wanted to drop by and say I like you! really enjoying your posts now you are back. thanks for posting about donkeys. i like them too. 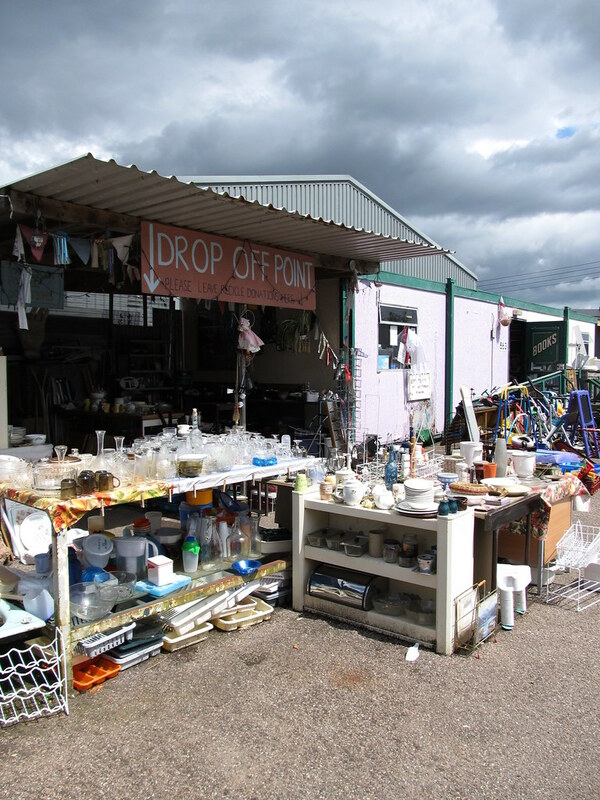 There was a "take it or leave it" at the dump on Nantucket when I lived there. It reminds me of the recycling heaven you visited. So wish more towns would do this! Must see the little cross stitch. Please. 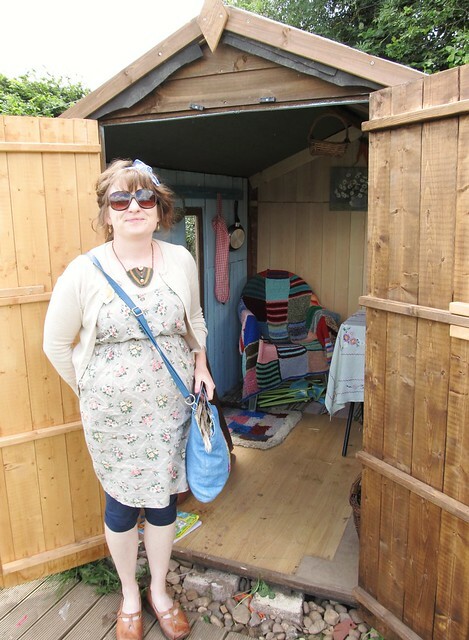 Sounds like you had a lovely day with your friend, her shed is so sweet, what an honour to cut the ribbon! i think devon is full of recycling centers. this one is near ottery st mary i believe, and yes i did ponder the old, "what happens if it rains?" as i watched the big old menacing clouds roll by! What a cute shed to call her own! thanks for explaining in the last post or two, how to add the "hidden" images for me! I really love the things you make, it's all so happy and cute and lovely! Reading your blog makes me immediately feel happy!